*The share price is the closing price on July 9. The number of shares issued was obtained by subtracting the number of treasury shares from the number of outstanding shares as of the end of the latest quarter. This report outlines Hamee's financial results overview for the fiscal year April 2018 and its earnings estimates for the fiscal year April 2019. Hamee Corp. defines its business domain as "happy mobile, easy e-commerce" (from which the name of the company is derived) and does the following 2 businesses: the business of planning, designing, and selling online, and wholesale of mobile phone accessories to achieve the vision of "happy mobile" (the commerce business) and the business of development and provision of "Next Engine," a cloud-type (SaaS) business management platform for e-commerce operators to realize the vision of "easy e-commerce" (the platform business). Hamee Corp. shows a top-class performance in the EC of mobile phone accessories, and also has the largest share in the platform market, having about3,000client enterprises. In addition to the company itself, the Hamee group is composed of six consolidated subsidiaries including JS Consulting Co., Ltd., Hamee Korea Co., Ltd. (Korea), Hamee US, Corp. (the United States), Hamee Taiwan, Corp. (Taiwan), Hamee India Pvt. Ltd. (India) and Hamee Shanghai Trade Co., Ltd. (China) and equity method affiliate: Shippinno Inc. Domain:happy mobile, easy e-commerce - Happy mobile with the commerce business and easy e-commerce with the platform business - 【Business Outline】 The company's business consists of the commerce business, the platform business, and others, which is a segment established in the term ended April 2018 (businesses related to new services that cannot be categorized clearly into either the commerce business or the platform business). The commerce business accounts for 86.6% of sales for the term ended Apr. 2018, while the platform business makes up 13.2% of the sales and others 0.2%. Commerce Business: By utilizing its capability of planning products, the company covers the upstream to downstream sectors of the distribution field, and operates EC efficiently with Next Engine. Hamee Corp. conducts product planning and production (as a fabless manufacturer), and purchase of general goods including mobile phone accessories, and sells such goods over the Internet to general consumers (retail) as well as through wholesale to major retail stores of general goods, electronics and home appliances, and the like. As for online sale, in addition to the domestic business, the company runs e-commerce websites for foreign general consumers and has opened their online shops in overseas e-commerce shopping malls, etc. through their overseas subsidiaries (cross-border e-commerce). Domestic online sale (retail): To sell products to consumers via a website with its original domain and leading EC sites The company runs multiple shops, including a website with its original domain, the same type of shops in EC sites, including Rakuten and Yahoo!, and stores with different concepts and targets in the same mall. For example, in "Hamee (each mall shop)," which is recognized as a comprehensive shop and easy to understand for everyone, the company operates "iPlus" "Hamee TV" for men, "Ketchup!" for women, and "Kawaii Kan," which collects goods considered "Kawaii" by store staff. Its strength is the business operation conducted jointly by Product Dept. (product development), CR Management Dept. (attending to customers), and Web Marketing Dept. (store development). Wholesale: Sale to retail stores and e-commerce operators In addition to wholesale of mobile phone accessories chiefly to leading retail stores of general goods, and electronics and home appliances, they have developed a website for online wholesale to e-commerce operators. The headquarters of the company is located in Odawara (Kanagawa prefecture), and they have branch offices in Tokyo and Osaka and post personnel called rounder who provide support for creating sales floors in physical stores. Sale to foreign customers: Online sale to general consumers by their subsidiaries in South Korea, the United States, Taiwan, and China The company wholesales products to online shop operators and retailers via the 5 consolidated subsidiaries in South Korea, China, the U.S., Taiwan, and India. The subsidiary in South Korea also plans, designs, and selects products. The subsidiary in India also serves as a back office for the EC in the U.S. In China, the company operates 3 shops, including one shop in the website with its original domain. Hamee has secured purchase networks with over 500 companies, which function also as networks of information on mobile phone accessories. Furthermore, a team that consists primarily of product designers and that is devoted to product planning and design has been formed in the company to work on production of highly-profitable self-planned products in cooperation with outside manufacturers including overseas ones. Besides, their products contain other goods such as toys and utility goods. They analyze sales trends including wholesale of more than 10,000 kinds of products, in order to know best-selling items in a timely manner and use the knowledge for product purchase and planning. Platform Business: To improve the attractiveness as a platform by differentiating it, increasing its advantage, and enriching apps with the know-how to operate EC The Company developed "Next Engine," a management platform that uniformly manages back-office operations necessary to run online shops (such as order receipt, order placement, procurement, inventory management, and analysis), and offer it to e-commerce operators who sell products over the Internet through their own websites, online shopping malls, and the like. "Next Engine" is a system for e-commerce back-office operations, which was developed by the Hamee group in the course of expanding their e-commerce business, as well as a backbone system which is still used in the commerce business segment of their corporate group. Eyeing the possibility of business expansion to overseas markets, the company has mapped out a basic strategy for "development and release of local (overseas) versions of Next Engine after actually conducting e-commerce businesses in overseas local corporations and accumulating knowhow, such as coordination with e-commerce shopping malls of each country." Provision of "Next Engine," an operation management platform for operators who sell products via the Internet, as SaaS "Next Engine" is a SaaS system that automates the process of online store operations and assists e-commerce operators in enhancing their management efficiency, with various functions such as automatic e-mail response, comprehensive management of order slips, automated coordination of goods in stock, and comprehensive uploading of web-pages of products. The system enables not only as much automation of the routine work of online shops as possible but also uniform management of multiple online shops that a company runs in different online shopping malls, including its own online shop and shops in major online shopping malls, and synchronization of the quantity of stock displayed for the wide range of online shops involved. The business efficiency so improved will contribute to making time for sales strategy formulation and product development, as well as to reducing overtime work. Flexible fulfillment of user needs by means of the main functions (standard specifications) and applications (expanded functionality; hereinafter referred to as the "apps") "Next Engine" is composed of the main functions (standard specifications) and applications (extended functionality; hereinafter referred to as the "apps"), allowing users to choose appropriate functions depending on their needs. Standard functions contributing to the convenience of e-commerce operators are installed on the main functionality in one package, while the apps are considered as options to satisfy unique needs that the standard functions cannot meet. "Next Engine" is provided also by OEMs; GMO solution partner, Inc. offers the system in the name of "Stock Manager" and GMO Commerce, Inc. provides it as "Sugoi! Net-Shop Kanri" (which literally means great management of online shops), respectively to their customers. The basic rate for "Next Engine" is determined based on the pay-as-you-go system where fees are dependent on the number of orders each e-commerce operator gains (this is a rate structure that is in proportion to the business scale of each user). In addition, multitudinous services such as the special server plan and customization (custom-made Next Engine) are also available with fees charged separately to each customer. The fees of apps on Next Engine vary for each application (free of charge, based on the flat-rate or pay-as-you-go system). Platform development (System to Platform) They published the API (*) of "Next Engine" in December 2013, achieving so-called platform development of "Next Engine" which makes it possible to offer on "Next Engine" myriads of applications developed by the company or other outside developers, etc. This allows establishment and operation of systems, according to the circumstances of each user company, by coordinating apps and "Next Engine." *API (Application Programming Interface) The API is an interface that makes it easier to read functions of a computer program (software), data managed by the program, and the like from an external program, and use them. Here, an interface means the specifications that specify a number of matters, including a function reading procedure and description method. Any functions compatible with the API do not need to be independently developed from scratch, which enables efficient program development. Net sales and operating income increased 10.3% and 24.7%, respectively, year on year. Net sales increased 10.3% year on year to 9,376 million yen. While sales in the platform business grew 21.6% year on year with the number of subscriptions for main functions and charged apps increasing, sales in the commerce business also increased 8.5% year on year due to favorable performance of domestic retail and overseas businesses. On the monetary amount basis, net sales increased 867 million yen. The breakdown is domestic retail business being 412 million yen, overseas business 302 million yen, platform business 221 million yen, and others 18 million yen. Outside Japan, sales in the U.S. expanded due to the development of new sales channels, and the e-commerce business in China including the cross-border business with Japan also came on a growth track. Meanwhile, domestic wholesale decreased 79 million yen. Operating income increased 24.7% year on year to 1,379 million yen. The increase in the selling, general and administrative expenses centering on personnel expenses and commission paid was offset by increased sales and improved gross margin ratio. Although operating costs increased due to an increase in foreign exchange loss and equity in losses associated with impairment loss on stocks of the equity-method affiliate, Shippinno Inc., ordinary income increased 20.9%. For the third consecutive year, it was selected as the "Competitive IT Strategy Company stock selection program" by the Ministry of Economy, Trade and Industry and Tokyo Stock Exchange. In the commerce business, although sales through wholesale declined from the previous fiscal year due to sluggish sales of products for iPhone X, sales through domestic retail increased, centered around the products for the old iPhone models. Sales through wholesale in the U.S. and the e-commerce business in China increased. In domestic wholesale, sales decreased mainly due to sluggish sales of products for iPhone X. Towards the New Year's holiday shopping season where the demand for products for the old iPhone models was strong, the company ordered increased production. However, the supply was delayed due to overlapping with the Spring Festival, etc., and the opportunity loss occurred. As a result, store demand has flowed to e-commerce, which also contributed to retail growth. However, current wholesale has turned to an increase in revenue because the supply system has prepared (there is no significant difference in the profit margin between retail and wholesale at the operating income stage). In the platform business, the number of subscriptions grew steadily. The number of subscribers for main functions of "Next Engine" at the end of the fiscal year increased 17.1% year on year to 3,095 companies. The number of charged apps subscribers increased 51.9% to 1,486 companies, and the number of stores increased 17.7% to 23,852 stores. Gross margin ratio of the platform business was 54.0%, down 9.0 points due to server investment (currently implementing 3-year plan which will end in the term ending April 2019) with the purpose of function development, an increase in support personnel, and improvement in the capacity in the number of subscribers and processing speed. Meanwhile, the gross margin ratio of the commerce business was 50.1%, up 5.0 points due to the reduction in wholesale sales ratio and the effect of the in-house planned products. The total assets at the end of the fiscal year stood at 5,042 million yen, up 802 million yen from the end of the previous term. Cash and deposits and net asset increased to reflect an increase in operating CF and healthy performance, and property, plant and equipment increased due to interior equipment with headquarters relocation which took place in October 2017. Capital-to-asset ratio was 68.8% (63.6% at the end of the previous term). In addition to an increase in income, retail sales grew, while sluggish wholesale improved capital efficiency. As a result, operating CF, which was 575 million yen in the previous term, increased to 1,245 million yen. Investing CF has increased cash-out due to acquiring 100% ownership of JS Consulting that offers consulting services for e-commerce businesses (Shibuya-ku, Tokyo, President and CEO Shohei Terada) and headquarters relocation. Financing CF has also increased cash-out due to repayment of borrowings and dividends. JS Consulting changed the name to Hamee Consulting Co., Ltd. Sales and operating income are estimated to rise 8.9% and 1.7%, respectively, year on year. Net sales are estimated to be 10,214 million yen, up 8.9% year on year. Although sales in the commerce business are projected to rise only 4.9% year on year because the forecast of domestic sales remains mostly unchanged from the previous fiscal year due to the uncertainty of the effect of the new model of iPhone, sales of the platform business are forecasted to increase 34.9% year on year thanks to strengthening back office operation support of the e-commerce business, effect of acquiring 100% ownership of Hamee Consulting, which provides consulting services to e-commerce business operators, and acquiring more contracts by strengthening partnerships. Operating income is estimated to grow 1.7% year on year to 1,403 million yen. Although gross margin ratio is estimated to be 52.3%, an increase of 1.6 points due to rise in the sales composition of the platform business, strengthening the back office operation support of the e-commerce business and increasing personnel expenses due to the consolidation with Hamee Consulting Co., Ltd. will squeeze profits. However, ordinary income is expected to be 1,391 million yen, up 9.8% year on year, thanks to improvements in non-operating income and loss as impairment of affiliated companies no longer exists. In the commerce business, domestic sales will remain unchanged, but it will be offset by an increase in overseas sales. Domestically, both retail and wholesale reflected the trend of iPhone X in the latter half of the term ended April 2018. Regarding the iFace series, the company is doing well with expanding product lines including the ones for the old models and selling related products such as glass films. Because the estimates are conservative, depending on the trend of the sales of the new iPhone model scheduled to be released this autumn, there is a possibility that sales exceed the estimates significantly. With regards to the platform business, sales will increase due to effect of acquiring Hamee Consulting as well as strengthening cooperation with partners such as distributers for early achievement of 5,000 subscribers. However, in terms of profits, cost is expected to increase due to upfront investment such as server upgrading, strengthening sales as mentioned above and increase in personnel expenses due to acquiring Hamee Consulting Co., Ltd. The domestic e-commerce market is expected to expand from 15.4 trillion yen in 2015 to 26.0 trillion yen in 2022 (Result by Ministry of Economy, Trade and Industry and forecast by Nomura Research Institute). Globally, the e-commerce market is expected to expand from 1.3 trillion dollars to 3.6 trillion dollars ("Research study concerning structural analysis of the ICT industry in the IoT era and verification of multi-faceted contribution to economic growth by ICT" by the Ministry of Internal Affairs and Communications, 2016). In the e-commerce market where high growth is anticipated, the company is planning to expand each business domestically and overseas by expanding the commerce business and platform business and seeking synergies between these two businesses. It will also increase its growth potential by offering new solutions through integration of know-how of manufacturing and distribution and BIG data from the commerce business, customer assets and systems owned by the platform business, BIG data obtained through "Next Engine," and IoT/AI related technologies such as IoT gadgets that are under research and development 【Efforts by each business】 Commerce business The advantage of the commerce business is that the company has succeeded in brand popularization with products. Starting from the distribution of accessories for mobile phones, the company has successfully expanded wholesale (not selling by itself offline) and retail (only selling by itself via the Internet) through a long-tail product lineup, and afterwards, it has increased both sales and profitability by having manufacturing functions as a company without a fabrication facility. However, competition in market of accessories for smartphones is intense, and too many products are sold via the Internet, making it difficult to find the product that a customer wants to buy. Thus, while it is of course important to elaborate product manufacturing, what are more important than anything else is brand development. From this point of view, the company gives weight to "brand popularization with products," namely, "creation of brand value with unique in-house planned products." The company has actually succeeded in enhancing an awareness of its brand and improving the gross margin ratio by proactively releasing unique in-house planned products, such as, not to mention the "iFace series" products which have been a smash hit, high-speed charging tap equipped with three outlets and capable of charging four mobile phones or charging tablets, diary case "salisty Q" for iPhone 8, 7, 6s and 6, and Bluetooth speakers featuring very popular Disney's characters. In addition, through intensified automation by strengthening IT (system development) and improvement of productivity, the company realized business expansion with suppressing cost increase, which is leading to IPO. Currently, it is promoting a multi-brand strategy in the retail field for further growth. As the number of stores that have opened seems sufficient for retail, the company has shifted its focus to the establishment of stores (websites), in which targets are clearly defined, based on the brand development strategy. Of course, it is based on brand popularization with products. Meanwhile, as for wholesale, in addition to traditional sales channels, including electrical appliance stores and general shops, it will open up new sales channels including the apparel market and markets related to fashion, such as bags and purses. Platform business The company will work on the development of related services originated from Next Engine and further evolution of Next Engine. As part of developing related services, the company acquired 100% ownership of Hamee Consulting Co., Ltd., which provides sales support consultation services for e-commerce business operators in the fourth quarter of the term ended April 2018. In the platform business, the company has been supporting back office operations after sales of Next Engine, but in the future, it will pursue synergies with sales support consultation (before sale) of Hamee Consulting Co., Ltd., and it will create services tailored to the growth stages of e-commerce operators from both back and front office operations. In addition, it agreed to develop new financial services utilizing transaction data of Next Engine with a major regional bank, Shizuoka Bank. Meanwhile, as for Next Engine, the company is working on the development toward a data platform. Next Engine started as a system for streamlining business operation by automating day-to-day routine tasks, such as order processing and inventory control, and unified management of multiple shopping malls. However, later, it evolved as a platform that can develop and use multiple applications by installing various APIs. A huge amount of data is accumulated with a virtuous circle where the number of users increases due to the increase of applications and the number of applications increases due to the increase of users. As of the end of the term ended April 2018, the number of subscribers for main function of "Next Engine" increased 17.1% from the end of the previous term to 3,095, paid application subscribers increased 51.9% from the end of the previous term to 1,486, and the number of stores increased 17.7% from the end of the previous term to 23,852. In the long term, the company will develop "AI/BIG data" solutions with early achievement of 5,000 main function subscribers and Next Engine that has evolved as a data platform utilizing the data. Towards a data platform Global development The company is operating the e-commerce business in South Korea (hamee.co.kr), China (taobao: strapya.world.taobao.com), the U.S. (hamee.com), Taiwan (Yahoo! : tw.mall.yahoo.com/store/hamee_taiwan) and India. Especially the business is growing in China and the U.S. In China, it is engaged in the sales at the shopping mall "taobao" and cross-border e-commerce at "TMALL GLOBAL," and sales growth has been remarkable since the third quarter of the term ended April 2018. Especially, the cross-border e-commerce (sales are done by Japanese corporations, and operation is done by local corporations) is rapidly expanding. Both taobao and cross-border e-commerce businesses are continuously strong, and further expansion of them can be expected in the term ending April 2019. 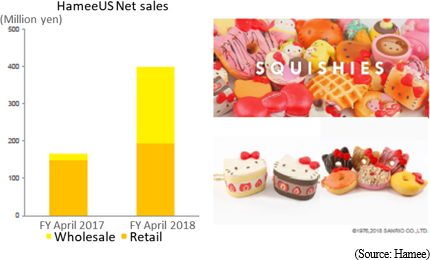 Meanwhile, in the U.S., B to B is growing based on solid B to C, thanks to good performance of Hello Kitty's character goods (SQUISHIES), etc. In the future, it will expand its business by expanding the lineup of strategic products, the iFace series (cumulative worldwide shipment is over 12 million pieces) and developing related products such as glass films and others. In the global expansion, the company has been internally developing necessary systems, while promoting localization of e-commerce. As these efforts came on track, it will evolve the system to the local version "Next Engine" and develop the platform business. In the long term, it is planning to develop "Next Engine" to be a global platform essential to e-commerce by connecting various countries platforms via network. Currently, all countries are in the investment phase (localization of commerce business), but contribution to earnings is expected to further increase for the term ending April 2019. 【Mid-to Long-term Growth Image】 The company will first steadily grow the commerce business by enhancing its brand capability through stronger original products and improving productivity through intensified automation. And, based on this, it will make the platform business as a growth engine. For the platform business, it will increase the varieties of applications, strengthen collaboration with external systems, obtain new customers, and, in the mid-term, develop solutions using AI and big data. Furthermore, it will expand the overseas commerce business, release Next Engine, and connect various countries' platforms via networks. Through global expansion of the commerce and platform businesses, it aims to accelerate its profit growth. 【Shareholder returns】 For the time being, the company plans to secure a payout ratio of 10%, while promoting the above growth strategies. However, in the future, it is planning to reward shareholders with a stable dividend of 20% to 30%. During the term ending April 2019, it plans to distribute 6.5 yen per share, an increase of one yen per share. It will be an increase for the third consecutive term since the first distribution in the term ended April 2016 (It got listed on TSE Mothers in April 2015). During the term ending April 2019, the business results may significantly rise, depending on sales of the iPhone new model. However, noteworthy is the approach of sales support consultation through cooperation with Hamee Consulting, rather than immediate results. Because Next Engine is based on the pay-as-you-go system, it will be reflected in Hamee's performance as sales of users will increase with sales support consulting. In addition, Next Engine has a trial period. About 200 companies start with trails each month, out of which about 50 companies will reach the actual subscription. In order to realize the streamlining effect of Next Engine, a certain level of skill is necessary, but many users cannot master proficiency within the trial period. This means that if the company can anchor the prospective subscribers by sales support consultation until they become proficient, the possibility of subscription will increase. The effect to prevent cancellation can also be expected. Many users cancel subscription due to sluggish sales. If sales support consultation produces results, it will lead to maintaining the subscription. The platform business for the term ending April 2019 is projected to increase by slightly less than 35% from the previous term, which is significantly higher than the 22% increase in the term ended April 2018. On the basis of the monetary amount, it can be calculated as (Sales of the platform business in the term ended April 2018) + (Announced sales of Hamee Consulting in the term ended October 2017) and a little more. If the company can achieve sales and income as planned at the beginning of the term in the platform business in the term ending April 2019, it can be considered that the company has a good start. ◎ Corporate Governance ReportUpdated on July 27, 2017 <Basic policy> The Hamee group set the corporate philosophy: We Create the Best "e" for the Better "e" World, and recognizes that its primary missions are to strengthen its corporate governance systems and promote the corporate philosophy in order to achieve sustainable growth and improve shareholder value. The company also strives to boost the supervision function of the board of directors and secure the soundness and transparency of business administration by hiring two outsider directors and three external auditors. The directors and all employees of Hamee will observe laws, regulations, and the articles of incorporation, fulfill their duties under sound social norms, strive to enhance risk control and supervision functions, and improve the soundness and transparency of business administration. <Reasons for Non-compliance with the Principles of the Corporate Governance Code (Excerpts)> 【Principle 5-2】 In the EC market surrounding Hamee, technological innovations and industrial changes are frequent, and it is very difficult to predict future earnings. Accordingly, it is considered that medium to long-term quantitative earnings forecasts does not always contribute to the appropriate judgments of stakeholders, and so the company does not disclose the numerical goals in its medium-term managerial plan. <Disclosure Based on the Principles of the Corporate Governance Code (Excerpts)> 【Principle 1-4】 The basic policy of Hamee is not to have so-called strategically held shares (e.g. cross-held shares). As of now, the company does not have such shares. 【Principle 1-7】 Hamee basically does not make transactions with related parties, unless it is guaranteed that it is reasonable to make the transactions and the conditions for the transactions are appropriate and they would not reduce the profit of the Hamee's group. When starting any transactions with related parties, the company will carefully judge whether the above items are guaranteed, and wait for a resolution of the board of directors, etc. in accordance with the Companies Act, Hamee's rules for internal approval and regulations for authority of management. In addition, the company regularly confirms with executives whether they have any transactions with related parties, and discloses facts through securities reports. 【Principle 5-1】 Hamee puts importance on constructive dialogues with shareholders and others, in order to contribute to the sustainable growth of the company and the mid to long-term improvement of corporate value, and makes efforts to increase opportunities for the president, directors in charge of IR, and staff of the IR and communication section to communicate with shareholders and investors. The IR and communication section holds a weekly meeting with the accounting and general affairs departments, to keep organic cooperation. As of now, the company holds a session for briefing financial results that is attended by the president twice a year, meetings with domestic and overseas institutional investors when necessary, telephone interviews, a briefing session for individual investors several times a year, and so on. The results of these events are reported to the board of directors. At the time of dialogue with shareholders, the company takes rigorous measures for preventing the leak of insider information. This report is intended solely for information purposes, and is not intended as a solicitation for investment. The information and opinions contained within this report are made by our company based on data made publicly available, and the information within this report comes from sources that we judge to be reliable. However, we cannot wholly guarantee the accuracy or completeness of the data. This report is not a guarantee of the accuracy, completeness or validity of said information and opinions, nor do we bear any responsibility for the same. All rights pertaining to this report belong to Investment Bridge Co., Ltd., which may change the contents thereof at any time without prior notice. All investment decisions are the responsibility of the individual and should be made only after proper consideration.